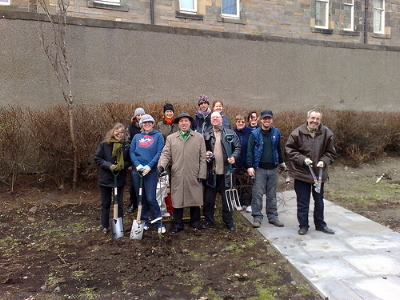 Just wanted to add this picture pinched from the Greener Leith website (thanks to Alastair Tibbitt who is behind the camera) because it really seems to sum up the spirit of Persevere Community Garden. We’re really looking forward to working with all the other groups involved: Persevere Community Flat, Green Seeds and Greener Leith. Unbelievably the picture was taken two weeks ago. Since then Greener Leith have planted the berry hedge in Pilrig Park, more than 65 metres of hawthorn, guelder rose, elderflower, ivy, hazel, gooseberries, rasperries, crab apples, and blackberries! A lot of rain has fallen in the last two weeks which is at least good news for all these new plants. Maybe you should also think about guerilla gardening, Take a look at http://www.guerrillagardening.org is this something you’re aware of? People sow seeds on waste land and turn it into something worth having. So much cool stuff happening out there, not least your community garden in leith. Good luck with it!